Finally shot my deer on the last day of hunting season! When suddenly. Several feet away. A deer. A doe. Staring at me eye to eye. We considered each other. I fumbled with the shutter. The camera sang its little greeting song, but the deer didn’t move. Snap, snap, snap! The camera shot its photos. You see, the deer wanted badly to cross the road. But I stood too near the road. We waited at an impasse. The camera kept shooting. Snap, snap, snap. 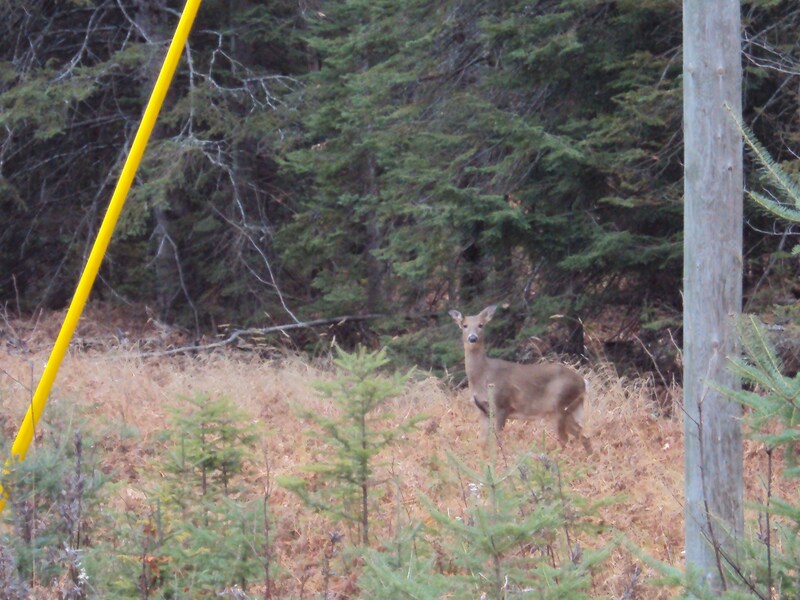 The deer flicked its ears and looked impatiently at the other side of the road, bored with my conversation. Let’s take a short commercial break before we see what happens. Will the doe move? Will Kathy get another shot? 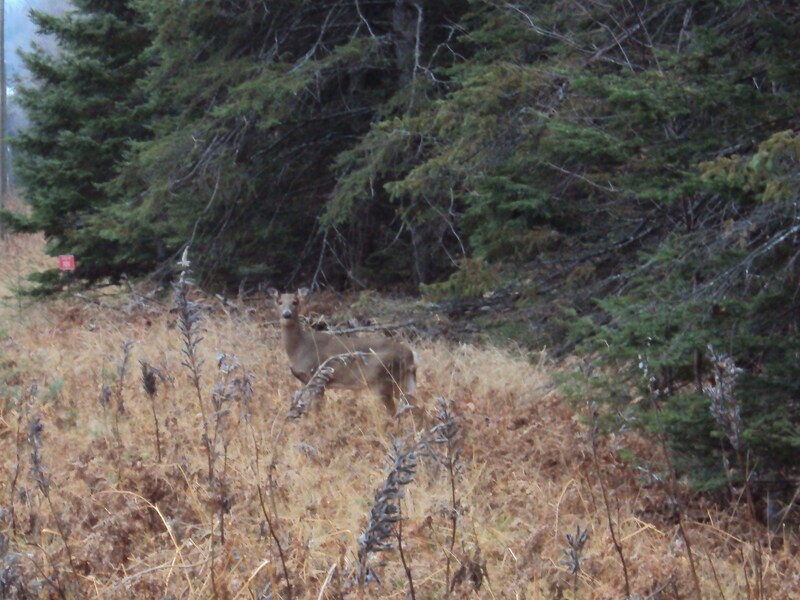 Will deer season end with a trophy photograph on the wall? 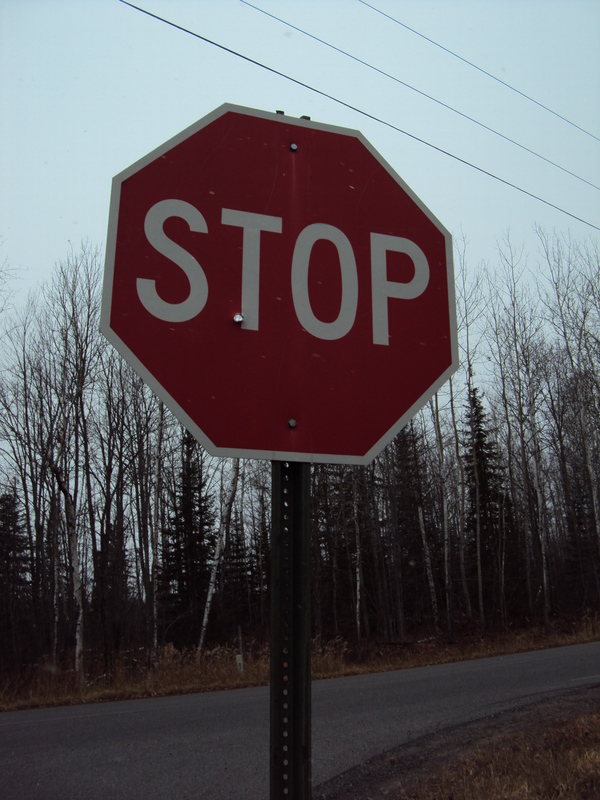 Yes, indeed, this is the stop sign I told you about yesterday. Our neighbor AJ had spotted the bullet hole which threatened the letter “T”. Someone obviously felt a little frustrated because he or she couldn’t shoot a deer. So they shot a stop sign instead. Back to the exciting final moments with my deer. And she's off and running toward the other side of the road! The camera is shooting wildly! The deer’s white tail is up in the air! She’s leaping! She’s crashing through the brush! She’s running to escape the shutter lens! I proudly returned to the house with my photo-trophies. The deer happily bounded into the woods to meet its compatriot. Tis the season of flying bullets. Time to bid farewell to the forest. All you non-hunters get out of the woods now! Every year come November 15th, I’m outa the woods. Goodbye forest! You won’t catch me wandering lazily through the poplar and maple trees, shooting with my trusty camera. No. Not even with a bright orange vest and hunting garb and orange cap could you convince me to hike in these beloved forests. Although, it seems, at least a few thousand extra visitors do fearlessly enter our north woods, ready to bag their seasonal deer. That’s not counting the local guys and gals who have been excitedly planning and plotting and checking their guns and preparing their bait piles for the last few weeks. They are all dreaming of venison stew. Nope, I’ve been properly scared over the years. Stories of people getting shot by stray bullets. (Not that it’s ever happened to innocent hikers…I don’t know.) Dire warnings by loving grandmother-type neighbors, “You stay out of those woods now, Kathy!” Sounds of gunshots at dawn: bang, bang, bang!!! Usually this is the time of year I say Goodbye Outdoors. Forget you. I am staying in my nice warm cozy house and hibernating until spring, thank you. You can’t make me go outdoors. Just try. Although some years I stay inside for the first week of deer hunting season and somewhere around Thanksgiving emerge and start cautiously traipsing up and down the road. There aren’t a lot of hunters in our rather populated woods, after all. Most of the out-of-towners who don’t know any better than to shoot indiscriminately on private property have left to return home to turkey dinners downstate or in Illinois. Then it’s safe. Or so I think. The bark face knows. It really knows. Everything. Today I wandered in the woods, “Goodbye trees. Goodbye birch-bark face, aren’t you precious? Goodbye pine cones. Goodbye old fort that the kids built. Au revoir. Enjoy your time with the hunters. Show them some of your beauty, eh? Let them see your magnificence.” And then I saw IT. Litter. Right there on the forest floor, behind our house. How dare someone litter back here? What were they thinking? How disgusting! Litter in the wood! And then, with utter clarity, I realized that We were the Litterers. This was our missing grill cover! It had flown off in a whipping wind sometime earlier in the summer and we could not find it again. So we traveled to Marquette and brought a brand new cover, to better prevent rust and exposure to the elements. And here was the original cover! A few sprays of hose water and surely it would be ready to do its duty once again. When the new one flies off on a windy day, that is. We’ll keep this one handy somewhere. What a lucky find! What a lovely afternoon it has been. Temperatures in the 50’s. No sounds of bullets, yet. The forest floor littered with leaves. I paused beside the old bridge which once led across the ravine. Our son nailed it together, all those years ago, back when he was still a youth building forts all over the woods. I looked at the bridge and smiled. Because I am really OUTA HERE! I am going to San Diego tomorrow to visit this beloved son! Have not once visited him on his turf since he moved to southern California three years ago. Would you guys like to come too? Let’s leave the woods together. Meet you tomorrow (or the next day) in San Diego, OK? Yikes, it’s getting late! Where should I go today? Oh no! It’s after dinner, and I haven’t any outdoor blog idea…or any photos to share! What should I do? The Old Friend "Eagle Pond"
Obviously, hop in the car and drive down to the Eagle Pond. One could walk, but there’s the problem of those waggy-tailed roaming dogs who live in between here and there. I’m sorry, but I didn’t want their tongue-panting sweet-lipped noisy jumpy company. I wanted….shhhh….quiet….sitting beside the pond until the Mind is as still as the reflection of trees on the water. Well, the Mind never did get that quiet. However, the camera lens began to wander here and there, up and down, around and around, seeking some interesting views. It wanted to see some deer lapping water from the still pond, or perhaps an eagle diving low, or maybe even the reflection of a dragonfly against the blue depths. Never mind what it wanted. The question is: what is that pink lifeboat the slugs are marooned upon? I carefully leaned forward to gently prod. Seemed like a pink mushroom. It rested very close to the water. The slugs seemed happy. I brought a dry purple cushion to sit upon next to the pond, considering that it rained gustily much of the morning. Can you imagine how soaked you would be if you lowered yourself unwittingly upon that wet green moss? You’d be headed home in two seconds flat, and just think how wet your car seat would get. Just before heading home, I discovered a new path in the woods. It was an animal trail, probably a deer trail. I imagined the deer coming down to drink in the early pink morning skies. Perhaps the beavers or otters splashing around. Chickadees singing overhead. Kind of makes you want to get up at 6 a.m. and sit cross-legged in the dawn, doesn’t it? Kind of? Almost? The above photo comes to you from inside the house, before opening the door, before walking outside. If I would have cracked the basement door even an inch the spotted fawn and its mama would have leaped off into the woods. 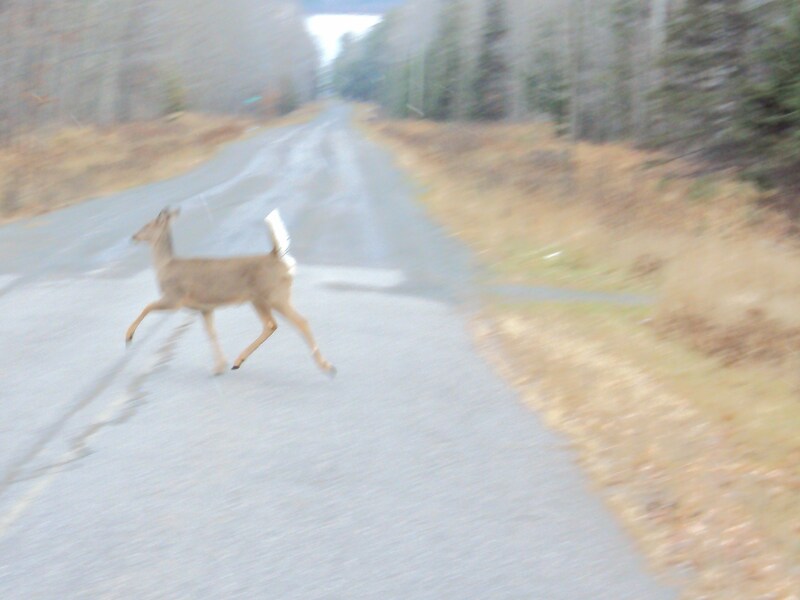 This particular fawn is a rather active jumpy fellow. It leaps on long legs and prances around mama with a particular spazziness. We glimpsed it ambling about a dozen feet away behind the garage the other day. What courage! What daring! Then it scurried back to Mama begging to stand beneath her and nurse. Today is Day 193 of the Outdoor Commitment. Yes, another day of rain. Another day of cold in the 50’s. People are getting snarly in town. It is suppose to be July 1st, isn’t it? Isn’t this suppose to be our warm weather for the year? (I suppose it’s because we complained a week or two ago about it being too hot. We’ll try to behave for the rest of the summer if it just warms up a little.) We had to start two fires in the woodstove today. In July! Our official rain tally: 3.9 inches since Monday. The last count measured 1.5 inches in the rain gauge. That’s a lot of rain. We split another load of wood this afternoon. Guess what. I am suddenly really truly enjoying this wood splitting. You get in a rhythm of hoisting, pulling the lever, tossing the split logs in the truck. Honestly, it sometimes feels like a dance. Very satisfying. Remember when I was not anticipating this task? How many times do our thoughts try to convince us that we’re not going to like something? When, in actuality, we discover that we do! The relentless rain has tossed around some flowers, toppled some garden plants and sprouted mushrooms on the lawn. Slugs crawl up the trees and on logs. I tried to photograph the mighty slug but he ended up looking fuzzy and out-of-focus at least three times. Perhaps tomorrow you’ll be entertained by slugs and mushrooms, but not today. Everybody knows when to pick spinach and lettuce, right? Before it bolts, or flowers. Our spinach has just barely grown to an appropriate height when I noticed that it was already bolting. Shame. It seems too early. I brought the colander out in the drizzly rain and pinched the flowers off (after photographing) and then harvested a mess for a salad. Nothing better than eating food fresh from the earth. Supermarket food rarely compares. Our taste buds explode upon munching into fresh vegetables. You can almost feel the nutrients soaring into the cells, deeply nourishing the body. If you don’t have a garden, try to find a farmer’s market. It’s worth any extra effort. I went to the swamp today. It started out as a morel mushroom hunt, but forget them. Official tally (from two trips): Morel mushrooms 3, Wood Ticks, 19. Or something like that anyway. Looks like the Wood Ticks are winning. It sometimes takes a long time for the Mind to settle down when you’re out in nature. It’s still having conversations with people, thinking of chores which need tending, perhaps even writing a blog. You have to wait until the Mind settles down. Then you can really begin to see what’s in front of you. Before that, you’re still lost in the world of Thoughts. I like it when the Thoughts begin to dwindle away and you’re truly present to the sweet call of red wing blackbirds, the cooing of mourning doves, the drone of swamp-life. There’s another thing which keeps us separated and apart from being present in Nature. We’re waiting for something exciting to happen. Where’s the ducks? Where’s the turtles? Where’s the beaver? It takes a long time, sometimes, to stop anticipating and wanting excitement. Whatever is in front of one’s face is what’s happening. Don’t be looking for those bear or moose or wolves. Just look at what’s present. I guarantee you’ll feel much more peaceful and content. It took me about twenty minutes to settle down and just be, watching the swamp. They say it takes twenty minutes of meditation before your brain waves actually change (perhaps to Theta?) It’s always good to give yourself twenty minutes of being present before moving on. Lots of trees have been gnawed off and carried away by industrious beaver to create a dam. You couldn’t see the dam from where I sat. There was a small fiddehead fern almost ready to unfold. It looks very tender, doesn’t it? On the way back to the car I found a young deer skull and bones. You can tell it was a young ‘un by its teeth. The older does and bucks have worn teeth. The Bud Creature again. Except this time he isn't a creature. He's a bud. I have nothing to say today. One of those days when it seems like there’s not going to be any theme to hold this blog together. Here’s what happened today: I went out to the mailbox, with the camera, prepared for a lovely jaunt in the woods. Here’s what really happened: I turned around, headed back to the house, tossed the mail on the kitchen table and settled down on the deck to finish reading a book in the 42 degree sunshine. So I was outside at least an hour today, but it all centered around a virtual tour of some intergalactic planet and some Jesuit priests and strange extraterrestrials. It was called “The Sparrow” by Mary Doria Russell and not the kind of fiction I usually read. But it was intriguing. Really intriguing. I’m glad I read it…but can’t determine if it’s a book you recommend to others. The New York Times Book Review insists it is. The above photo is our Bud Creature from April 26th, from a different angle. Or maybe it’s not the Bud Creature at all, but a cousin hanging from a nearby branch. I am hoping this new angle might provide better identification. Could it be an elderberry tree? Anyone know definitively? So we have a root. Yep. Not much more to say about that one. How about a rotting leaf being swallowed up by new spring grasses poking through its dying corpse? Still not impressed? Looking for something more exciting, like perhaps our perennial garden plants finally poking their way through the leaves (which really someone should gather up and toss in the woods)? Exhibit A, below, is supposedly our Bleeding Heart, although I am an ignoramus when it comes to naming plants along the front of our house. My friend Nancy was utterly convinced I would become a true flower gardener, but she’s finally conceded Barry seems more interested than yours truly. I do like ’em, honest I do. When they bloom, they’re gorgeous. For some reason it’s easier to get excited about strange bud creatures and odd angled roots and rotting leaves. Go figure. What else to share? How about the most exciting news ever? OUR SNOW IS ALMOST GONE. Yep, the last vestiges. By “last vestiges” I mean the areas where the snowplow pushed the snow into hard banks. I could only count three small areas in the yard where the snow remains. Three small areas! One, two or three days from now it WILL be gone. Aren’t you all pleased as punch? And goodbye Snow, as well. So now you know it’s possible to ramble endlessly about Nothing. You know how tame the deer were around here this afternoon? One of the ladies, probably a pregnant doe, decided to lie down on the side lawn. She was so relaxed she didn’t even move a muscle when we wandered out on the deck with a camera. We said “It must be Lempi” (our injured limping doe) but when this one finally rose, and ambled off, she walked perfectly and simply looked casually over her shoulder before meandering into the woods. Guess whose birthday is tomorrow? Time to celebrate our Earth! Did everyone receive his or her party invitation? I’m hoping everyone is prepared for the Big Event tomorrow. We all know whose birthday it is, right? We all know what we’re celebrating tomorrow on April 22nd, right? In case you haven’t opened your party invitation…it’s EARTH DAY! (That translates as the Earth’s birthday, for those of you who didn’t know.) That means it’s party-time. Has everyone planned a gift? If you’re reading this blog consider yourself tagged that the Earth needs a present tomorrow. Something small perhaps…or something large. Anything that says “Thank You” to the planet which so lovingly supports us, clothes us, feeds us, delights us, nourishes us in a thousand ways. Look at the wet sloppy snow piled up around my car. Not going anywhere today! So what ideas have you pondered to honor the earth? Turning off lights for a while? Taking a shorter shower or bath? Turning down the thermostat? I would be delighted to hear ideas, as we’ll need to do something sweet tomorrow. The nitty-gritty picking up will come later. So we were snowed in again today. Barry made it to work with the 4 wheel drive Studebaker, but I wasn’t going anywhere. The snow continued to swirl endlessly as the low pressure system stalled out over the Great Lakes. Points south are getting rain, but we’ve been blasted with between five inches and two feet of the white stuff. Here in the lakefront belt, I’m guessing we received a foot of snow. But since it’s melting and warm (32-34 degrees) it’s all compressed to a heavy damp wet mass. Try to imagine how difficult it was to walk to the mailbox at mid-day. Every step felt weighted, like maneuvering through cement-like snow. Of course the local schools were cancelled. Of course the roads were…challenging. Of course we’re looking longingly toward later this week when the temperatures are scheduled to rebound into the 50’s. Barry even suggested I shovel the deck so we can lounge outside later in the week. One final note, now that the snow is letting up. Do you know what one of the top searches on this blog is? People randomly type in “vegetable scraps” and guess whose blog comes up? This one! All because I tossed in a photo of vegetable scraps we feed the deer during the winter. Therefore, to appease all the folks searching the Internet for “vegetable scraps” I am about to offer another tasty arrangement for the deer, thrown under the oak tree at noon today. 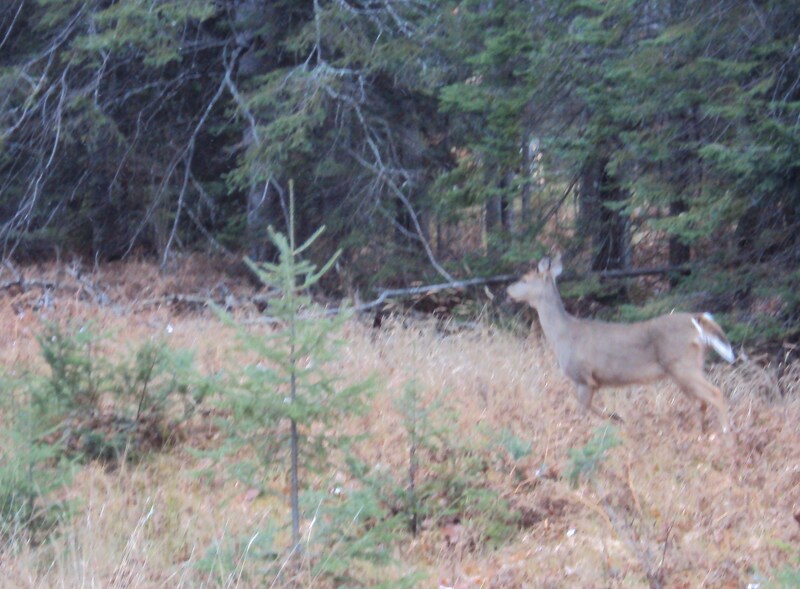 By mid-afternoon, a lone doe made her way to the scraps and munched every last tidbit. Except for one celery stalk. Do NOT taste the pine sap! You WILL regret it! Just try to taste that sap. I dare you. I don’t know about the sap in the above photo. You could try it if you want. But considering the experience I had today tasting pine sap…I do NOT recommend it. For some reason, I was thinking of that luscious maple sapsicle from a couple weeks ago. Wasn’t it lovely? Wasn’t it sweet? Wasn’t it delicious beyond words, at least before it fell from my eager hands and crashed into a zillion pieces on the dried-leaf ground? AHHHHH! AHHHHH!!! My mouth suddenly filled with acrid turpentine-taste, one of the most awful tastes known to mankind. I spit it out for ten minutes afterward, trying to forget the experience. I am hoping you’ll remember this, next time you placidly reach for a dripping bit of sap. Get your trees straight. Avoid the pines with a vengeance. There’s only turpentine dripping from those trees. The snow is disappearing. It’s official. There’s only random piles here and there, mostly plowed-up drifts in key driveway positions, mostly in shady areas. We surveyed the woods beyond the deck this afternoon. Only one tiny tiny pile lingers way out there. And it’s dissolving under the near-60 degree temperatures. Oh hurray! Spring comes to the North woods. It’s official. The eventual pink and purple and white lupine flowers are pushing their introductory green leaves through the dried leaf cover. They’re looking at their internal watches, knowing they’ll bloom in late May or early June. OH! And more excitement; I almost forgot. Last night Barry woke me up (he’s always waking me up after 10 p.m. bedtime with outdoor news) with the breathless announcement: The Spring Peepers were peeping! Those are the tree frogs which roost on trees and sing their spring and summer songs, filling our dark nights with wonder. The tree frogs are back! I am truly hoping to convince one of the lovely frogs to pose for a photo shoot sometime. Barry says we need only ONE rainy spell before they’ll burst into wild and abandoned night-time song. They’re very late this year, almost a month later than normal. Now it’s mostly like “croak!”…wait…”croak!”….wait. But they’re plotting their egg-laying. In puddles of quiet stagnant water. That’s why they’re singing. Enough of the moon! How about we concentrate on the sun for awhile? Look at it cresting above the tree line over the Huron Bay this morning about 7:20 a.m. Easter morning: He has risen. We have risen. Look at that lemon colored sunrise shining us all awake, all of us to our highest potential. The temperature hovers around 50 degrees these last few days. The sun shineth all day long in a blue sky, keeping all of our spirits smiling. View from the forest floor. Don't the tiny twigs look like giant trees? Today the first geese honked overhead, way high up in their V-formation, steering north. They’re headed for Canada. The honking heralds spring every year. Sometimes they land down in the bay and honk restlessly before sunset. Sometimes they fly so low you glimpse their goose-bellies. Today the camera strained its neck to catch their etchings in the sky. Can you see them? Deer hovered around the house today, munching sparse greenery. We’re wondering how they find enough to eat in this spring season before the landscape bursts into green foliage. About four of them grazed on the side lawn all afternoon. I attempted to lure them with a carrot but they looked on with suspicious eyes. 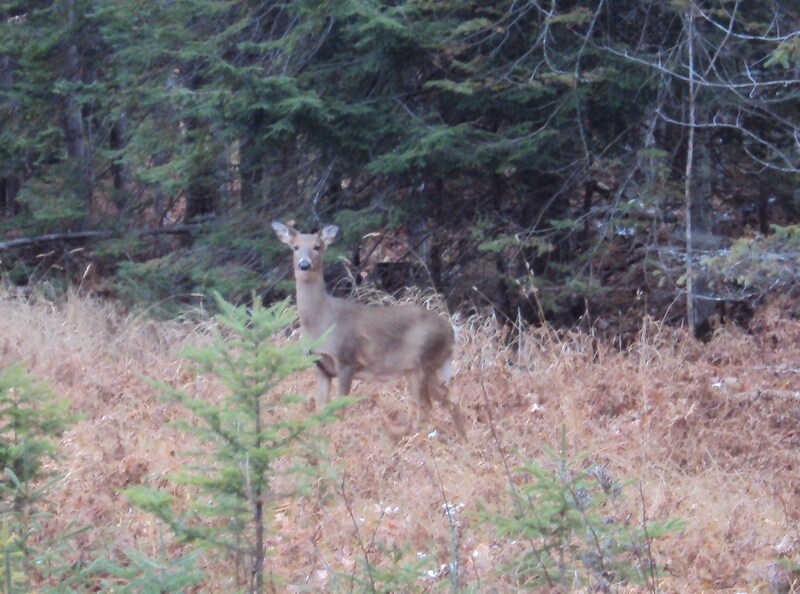 Walking toward them, they catapulted off into the woods, their white tails bounding. Hello Doe, are you sure you wouldn't like a carrot? It’s so easy to go outside at this temperature. You walk in the house, you walk outside. The door doesn’t seem as solid. I must have ventured outside at least six times today. What kind of commitment is this, when the “outside” and “inside” seem so much the same? Late in the afternoon Barry and I celebrated Easter on the deck. We grilled fish (caught in the Keweenaw Bay the beginning of March) with a salad, frozen broccoli from last year’s garden, salad and home-baked bread. We raised a glass of wine, toasting our gratitude for so much. The trees reflected in the wine glass, joining us in our celebration. Cheers to all! Happy Easter!